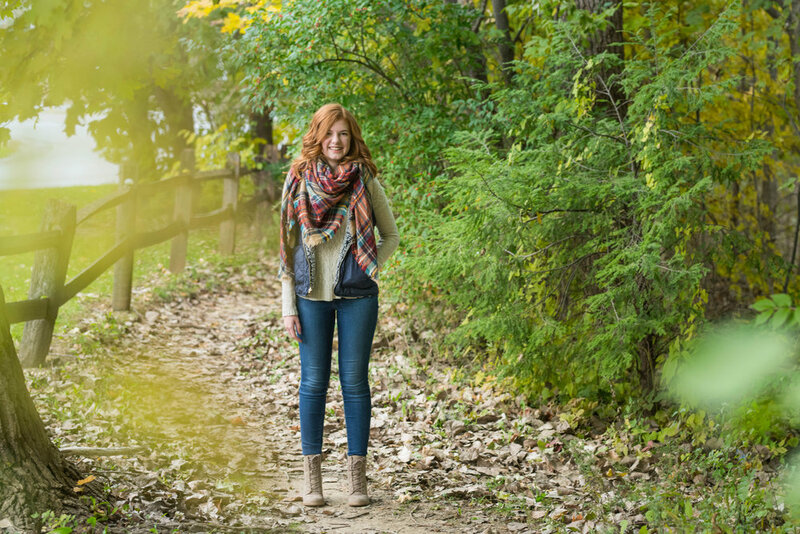 We had the most beautiful evening and gorgeous colors when we took Ashley’s senior photos! I have gotten to know Ashley through church at PCC. VBS 2018 was when Ashley shadowed with me in photography and we got to spent a lot of time together. It was so much fun and now she volunteers once a month on the photography team at church. She is such a fun person to be around and is full of creativity. Ashley goes to Plainfield High school and her favorite subject is English Literature. Three worlds that Ashley would use to describe herself are creative, smart, and quirky. Her favorite food is pasta (yummmm) and if she could have any super power, it would be telekinesis. Something that Ashley can’t live without are books and something many people don’t know about her is that she loves Halloween, haunted houses, scary movies, decorations…all of spooky season. One of the biggest challenges she’s faced was having open heart surgery in July 2015—the summer before her freshman year. Ashley’s dream job is one where she is excited to go to work each day and she plans to attend university to probably major is biochemistry. Ashley, I wish you the best of luck as you finish your senior year and in what lies ahead—continue to follow Jesus and serve Him well.